This also dovetails with adaptive technologies for people who need different physical controls. Being able to make a new input device, and drop it seamlessly into an existing electronics/software stack, lowers the bar for a lot of would-be-adapters. Very cool! As a R/C enthusiast who suffered a C6 SCI, this is a great idea. It could allow those with limited bodily mobility to participate in R/C as well as a great number of other activities. To be honest we never thought of Alpha V1 in this way; but we are glad you brought it up. It would be our honor to see Alpha V1 helping people with mobility impairments. We work our hardest to bring Alpha V1 to market as soon as possible. Thank you Nate. We are glad you liked it. Based on an Arduino Nano? Somewhat surprising, since other RC projects have long since moved to 32-bit processors to handle all the functionality they incorporate. I’m referring to Er9x, OpenTX, and DeviationTX. It is actually going to be based on Arduino Mega. We have spent many hours to pick the most suitable Arduino board for Alpha V1 and we picked Mega. We considered majority of potential Alpha V1 users in decision making and tried not to include our personal preferences. This choice did not make our lives easy because we faced many challenges to make sure Arduino Mega can manage all the tasks considering its low processing power, but we think this is going to benefit majority of Alpha V1 users. We have considered making an ARM based version for pro users in future, but at this point it is too early to make that promise. openTX and 32 channels on an arduino mega might be another option, the case is an interesting aspect, expandability and ergonomics, that area is very opinionized. openTX has dropped support for Arduino Mega, but this was never our motivation going forward with Alpha V1. 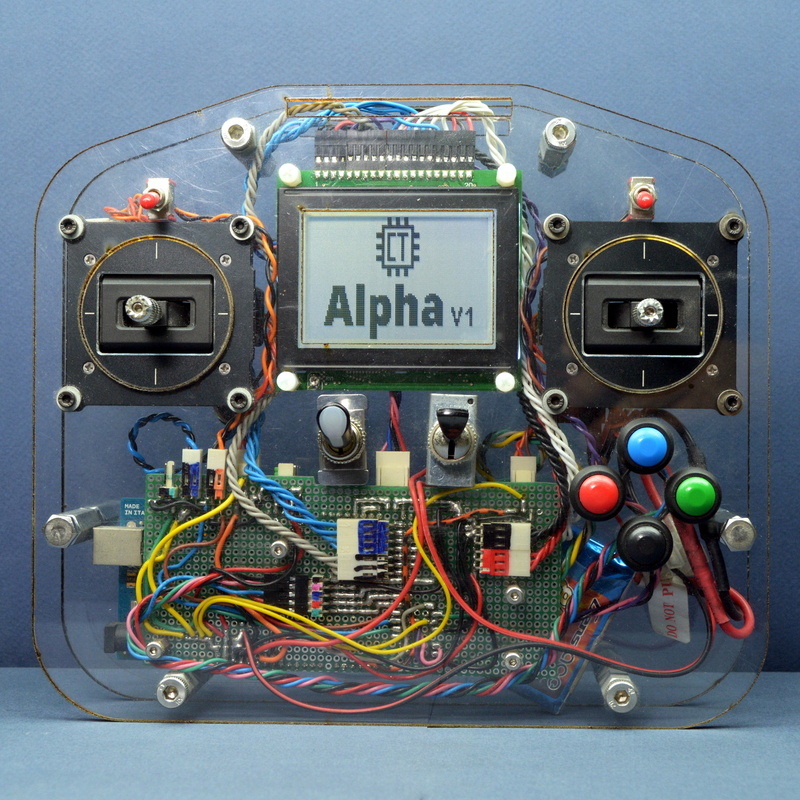 Alpha V1 is not another RC Transmitter (Open/Closed source). It is an open source remote controller that let you customize it easily. We have also made it easy to attach many different input devices to the remote controller, by both reducing the mechanical difficulties and also providing code-free support for various analog and digital input devices. ask owner for link to code. We have plans to launch a crowdfunding campaign and we would like to honor our backers by making sure they are the first users and owners of Alpha V1. In order to guarantee that, we should make sure the source code remain private at this time. Also, as mentioned in our previous response, we may be able to help if you provide us with more information.